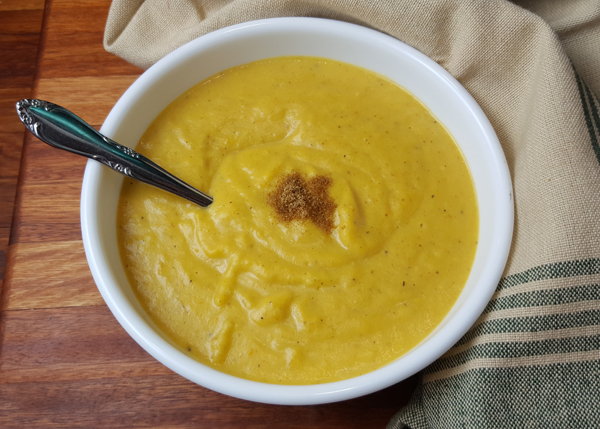 The combination of flavors in this Spiced Winter Squash Soup (Paleo) recipe are incredible.Winter squash is sweet and delicious. My two favorite (and the ones I use in this recipe) are acorn squash and butternut squash. Use this recipe to choose your favorite curry powder. They are all different. Some are spicier than others, some are sweeter than others. I have used Indian Life Gourmet Indian Spices and McCormick Organic Red Curry Powder. Preheat oven to 400° F. Rinse acorn and butternut squash, cut in half from stem to blossom end (top to bottom), and scoop out the seeds. Drizzle the inside of the squash with avocado oil, place on a baking sheet, cut side down. Place in hot oven and roast for 40-50 minutes or until squash is easily pierced with a fork or knife tip. Remove from oven and allow to cool slightly. Meanwhile, saute onions in remaining avocado oil in a medium Dutch oven until translucent. Add minced garlic and saute for an additional 1-2 minutes. Pour in coconut milk, add spices, salt, and pepper into the Dutch oven and stir until well combined. Scoop butternut and acorn squash out of the skin and into the Dutch oven with the rest of the ingredients. Using an immersion hand blender, puree soup mixture until smooth and creamy. Reheat slightly and enjoy. Tips for Choosing Winter Squash: Select squash that are firm and blemish-free with no nicks, holes, or bruises. A good acorn or butternut squash can be stored for many weeks, sometimes months without going bad, so stock up when they are in season. Use the ones that have marks first for longest storage time.